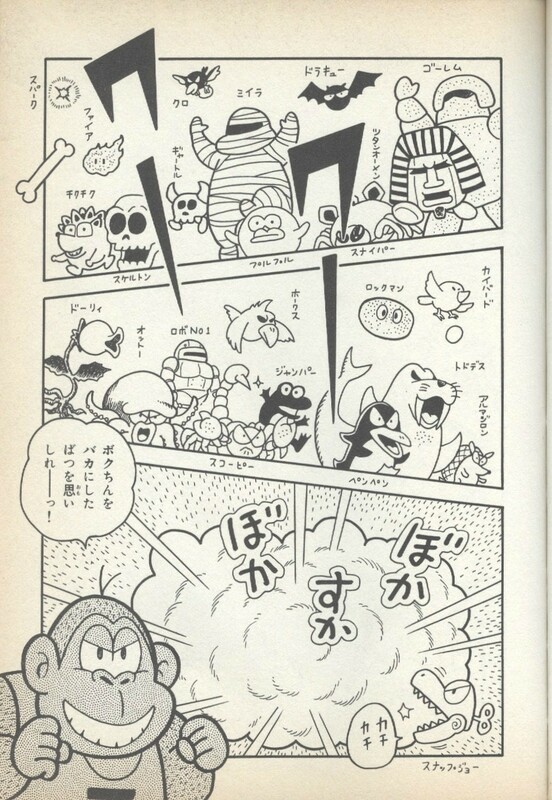 The Golem is an enemy in Donkey Kong for Game Boy. As its name and countenance disclose, it is a well-structured moving antropomorphic statue. The enemy appears in Stage 9-1 of the Tower, and is the only one of its kind to be seen during the course of the game. The Golem has the same behavior as Aqua Man, Miira, and Penpen, enemy species encountered by Mario before reaching the Tower. It patrols its platform in a set direction and at a constant slow pace, turning around after bumping into a solid wall or meeting one of the platform's margins. Mario can lose a life if he runs into the foe's left or back side, but is capable of standing upright on the Golem after jumping on it. It is further possible for him to pick it up and toss it anywhere. The Golem is the only interactive enemy of Stage 9-1, and with no weapons around, it cannot be knocked out. Within the stage's context, the Golem resides on a conveyor belt located underneath a stone-block ceiling, together forming a tight tunnel. However, the enemy remains unaffected by the conveyor's works, and proceeds in walking on it as if it was a generic immovable platform. This page was last edited on August 4, 2018, at 23:23.